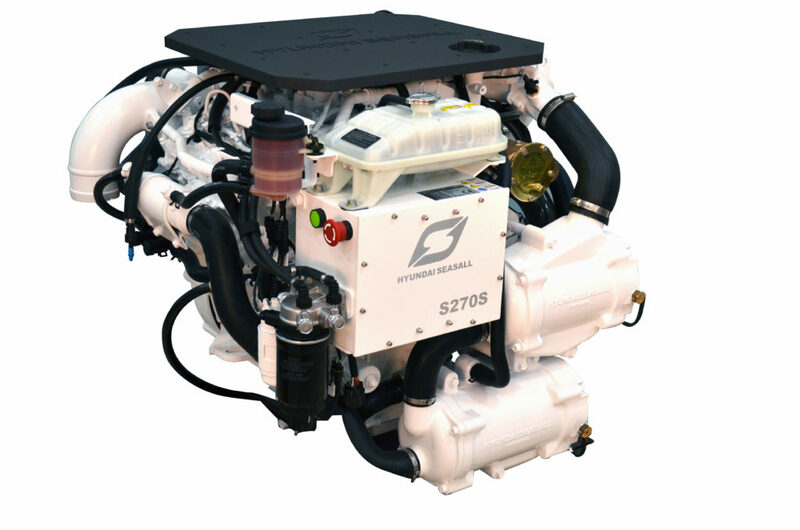 Hyundai-Seasall S250 Marine Engine from Performance Diesel, Inc.
Piezo controlled common rail injection system delivers 270 hp and 57.6kg·m of torque from the 3.0 litre V6 Common Rail Direct Injection(CRDi) engine. The advanced design makes it ultralight, quiet and fuel efficient with extremely compact dimensions. The engine features a unique Compacted Graphite Iron(CGI) cylinder block. The CGI block is lighter and quieter than conventional grey cast iron and demonstrates at least 85 percent higher tensile strength, 45 percent higher stiffness and approximately double the fatigue strength of iron and aluminum. It is a prime example of the type of innovation and improvement which Hyundai SeasAll is bringing to the marine engine Industry. The S270 features a quieter, cleaner, greener, meaner inboard engine with its leading edge diesel technologies. The S270 engines are also available in stern drive, shaft drive and waterjet configurations for even more powerful options.